A collaboration between Spectrum Health Medical Group and Munson Medical Center has resulted in the creation of the Helen Devos Children’s Hospital Pediatric Clinic in Traverse City. Read on to learn more about this collaboration and what it means for the Traverse City area. This piece was originally published in the 2014–2015 issue of the MyNorth Medical Insider. Physicians in the Grand Traverse region have long wanted to reduce the number of trips that children with complex medical issues must take to downstate hospitals for specialty pediatric care, especially for things like regular checkups or more routine aspects of treatment. Providing care closer to home would not only decrease the inconvenience of travel, but also would help families’ finances by saving gas money and avoiding time off work. 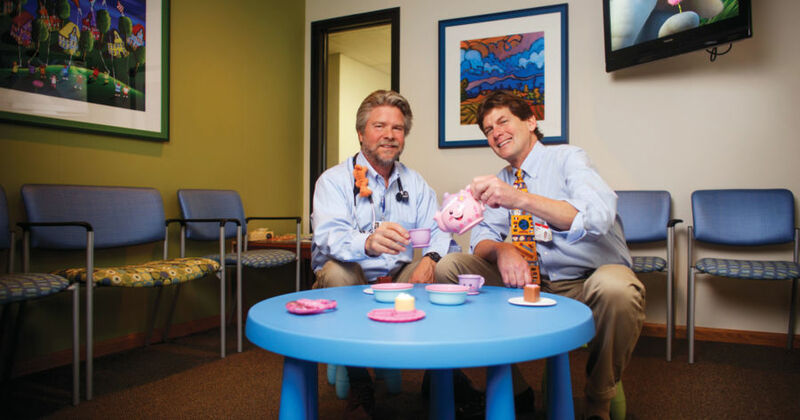 “In conversations with physicians at DeVos Children’s Hospital, we’d say things like, How can we collaborate to better care for our region’s children?” says Dr. Robert Sprunk, a pediatrician with Grand Traverse Children’s Clinic. Earlier this year, several of those conversations became reality with the opening of the Helen DeVos Children’s Hospital Pediatric Clinic in Traverse City, a collaboration between Spectrum Health Medical Group and Munson Medical Center. The clinic is offering regular visits—in some cases a few times a month, in others a few times a week—by physicians with specialties in pediatric orthopedics, pediatric gastroenterology and pediatric neurosurgery. The clinic builds upon other children’s specialty clinics that DeVos physicians have started up in recent years, with specialties in pediatric endocrinology, hematology, oncology and cardiology. Sprunk credits Dr. Michael Forness, a DeVos pediatric orthopedic surgeon, for playing a large role in the clinic formation. Forness practiced in Traverse City until 2004 and then went to DeVos, so it was natural for him to see the health care connections between Grand Rapids and Traverse City. “He began a clinic in Traverse City that ran three days a week, three weeks a month, so that was a tipping point, to have a clinic with that much activity,” Sprunk says. The new clinic is one more step in Munson’s desire to increase what Sprunk calls the pediatric services line. “If you look at the number of in-patients at Munson at any given time the pediatric share is a small number, but if you look at the total services rendered for children over the course of a year it is substantial,” Sprunk says. Bringing pediatric specialists into Munson’s world will also help regional pediatricians provide more comprehensive care close to home. For Sprunk, it’s gratifying to see pediatric care continue to expand at Munson, a trend that is part of a pediatric care tradition that he sees reaching all the way back to the 1930s, when, in the depths of the Great Depression, Dr. Mark Osterlin helped launch the Central Michigan Children’s Clinic.